Linked lists are among the simplest and most common data structures. They can be used to implement several other common abstract data types, including lists (the abstract data type), stacks, queues, associative arrays, and S-expressions, though it is not uncommon to implement the other data structures directly without using a list as the basis of implementation. The principal benefit of linked lists over a conventional arrays is that the list elements can easily be inserted or removed without reallocation or reorganization of the entire structure because the data items need not be stored contiguously in memory or on disk. 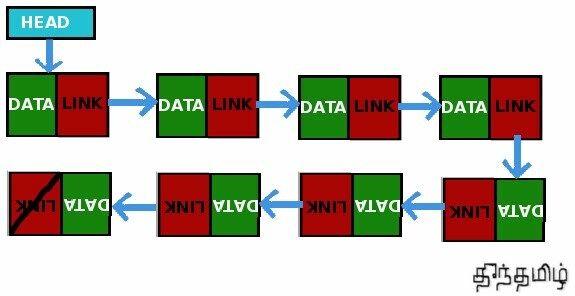 Linked lists allow insertion and removal of nodes at any point in the linked lists, and can do so with a constant number of operations if the link previous to the link being added or removed is maintained during list traversal.On the other hand, simple linked lists by themselves do not allow random access to the data, or any form of efficient indexing. Thus, many basic operations — such as obtaining the last node of the list (assuming that the last node is not maintained as separate node reference in the linked lists structure), or finding a node that contains a given datum, or locating the place where a new node should be inserted — may require scanning most or all of the linked lists elements. //Linked Lists in C++, Simplest data structure. // declare the Node structure. head = var; // our head and tail will be pointing to the same Node. Node *currNode = head; // start from the head node. cout << "n Node Number = " << ++count << " Has data ="
currNode = currNode->link; //update the currNode such that it points to next node now.
} while (currNode != 0); // stop if currNode == 0 because we have reached at the end of list..
while (currNode->link != tail) // move current node until it link to the end node..
currNode->link = NULL; // first put null to next link. tail = currNode; // update the tail..
delete var; // delete the old tail node..
<< " Press 5. To Print the Complete List from head to tail"
cout << "n Invalid Option, Please use any of the listed options"
As mentioned in the comments above, we can move forward through a node and reach to the required node in linked lists and do whatever we want with the required node. The link lists have the simplest logic for doing any kind of operation with it, that is why linked lists are considered the most simple data structure by programmers. You can see the function for every operation in the above linked lists.